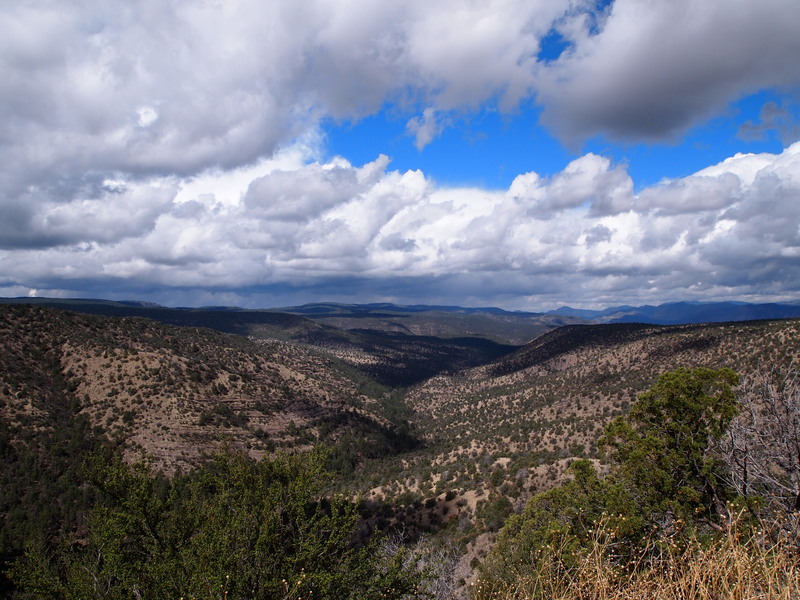 On Friday morning we packed up our tent, loaded up the car, grabbed some breakfast and beverages at Javelina Coffee House, and hit the road to the Gila National Forest (pronounced Hee la). 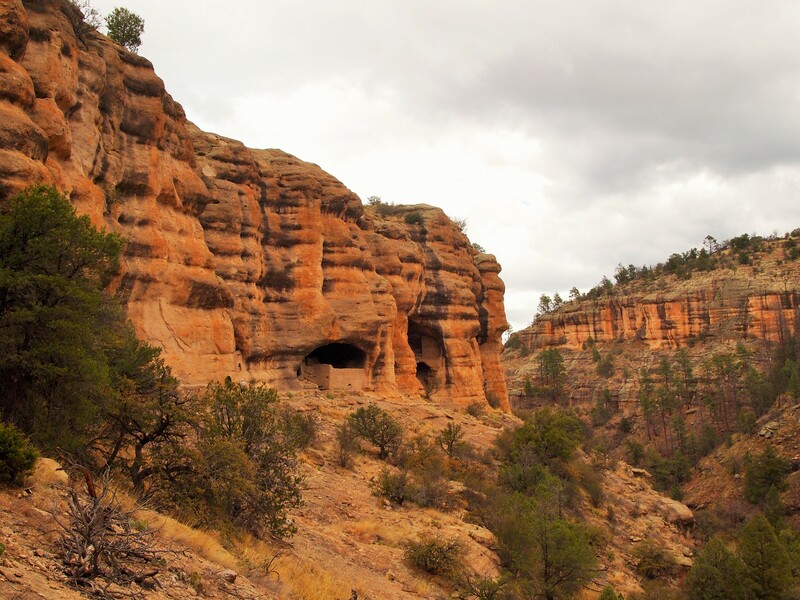 We knew there were thunderstorms in the forecast for the afternoon and evening, but we hoped we could visit the Gila Cliff Dwellings and set up our campsite before they hit. We were mostly fortunate. 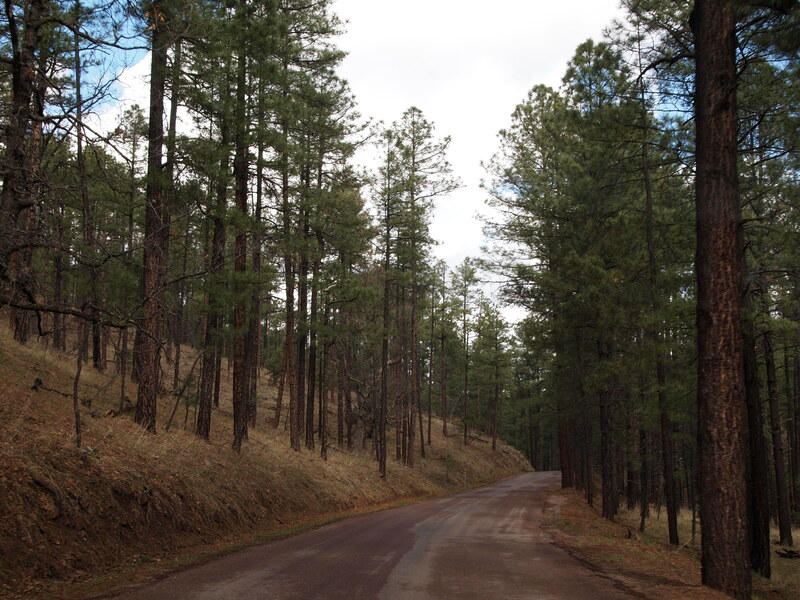 Our drive into the forest was quiet and peaceful with clear skies. 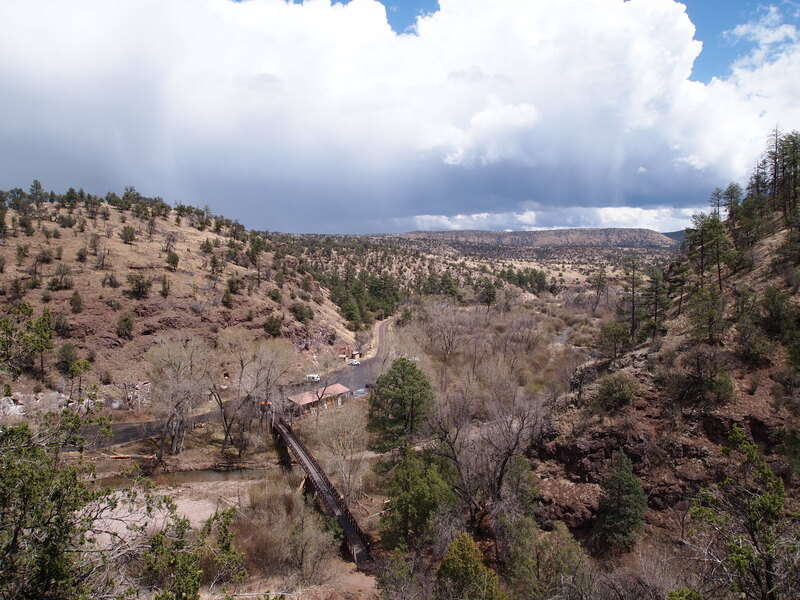 We stopped at the visitor’s center before continuing to the cliff dwellings. They had a small exhibit which helped introduce us to the area and the history behind the dwellings. 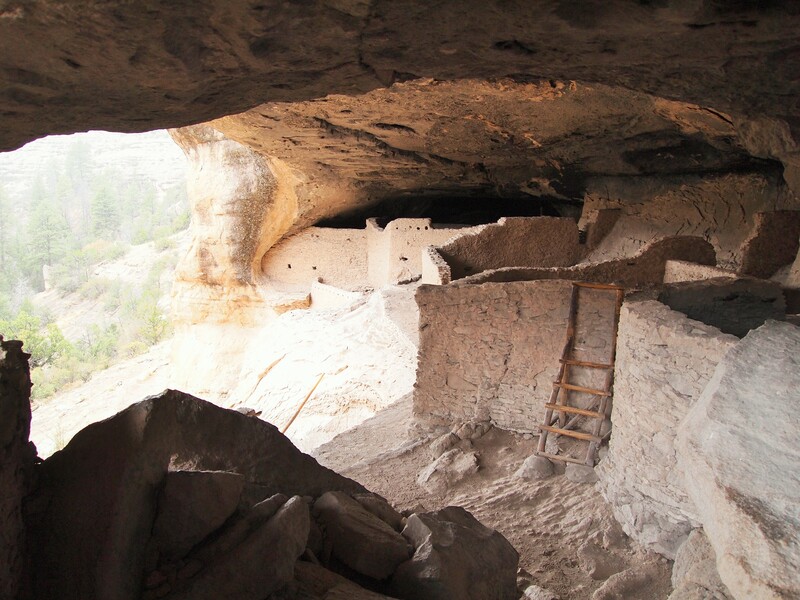 Although the caves were most likely used by nomadic peoples for thousands of years as temporary shelters, the Mogollon (pronounced Moh gee yone) people created permanent structures within the caves and lived there between the 1280s and early 1300s. Then they left. The cause for their departure is unknown. Their settlements were discovered in the 1870s by settlers looking for water and land on which to build homesteads. 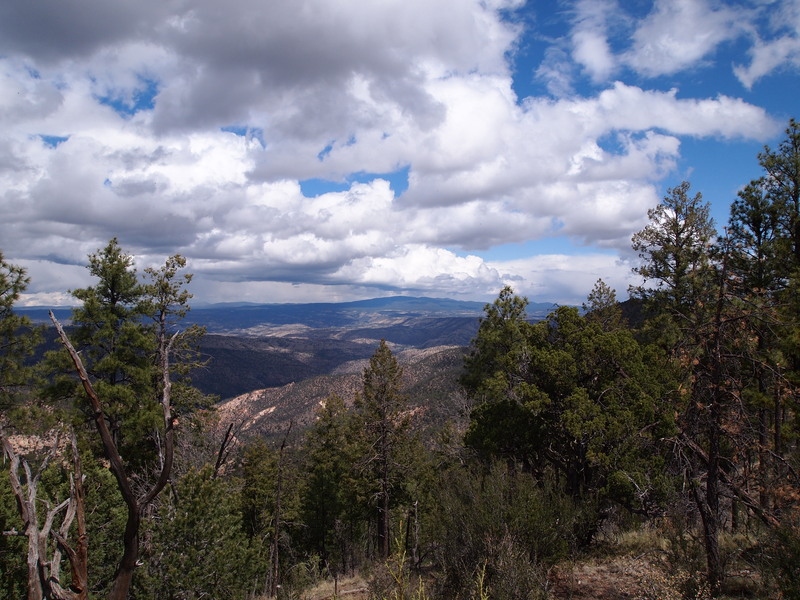 The area, a total of 533 acres, was made a National Monument in 1907 by President Roosevelt. 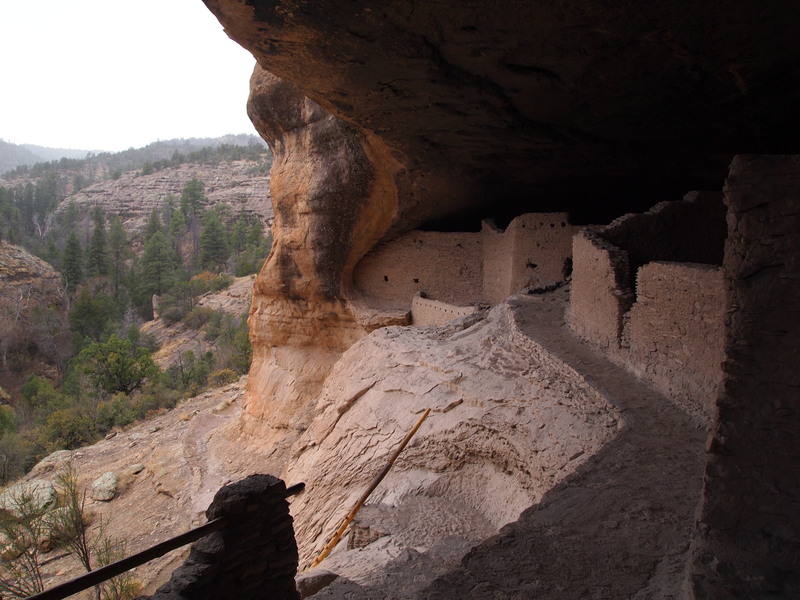 We drove the short distance to the dwellings’ parking lot and from there it was only a mile loop hike to the dwellings. 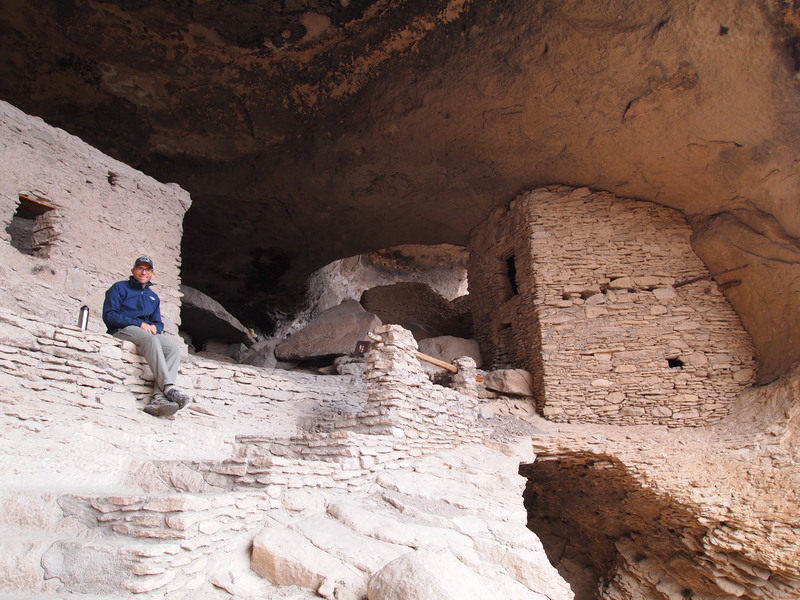 The trail gradually climbed along the creek until we had to make the final steep ascent to the dwellings. 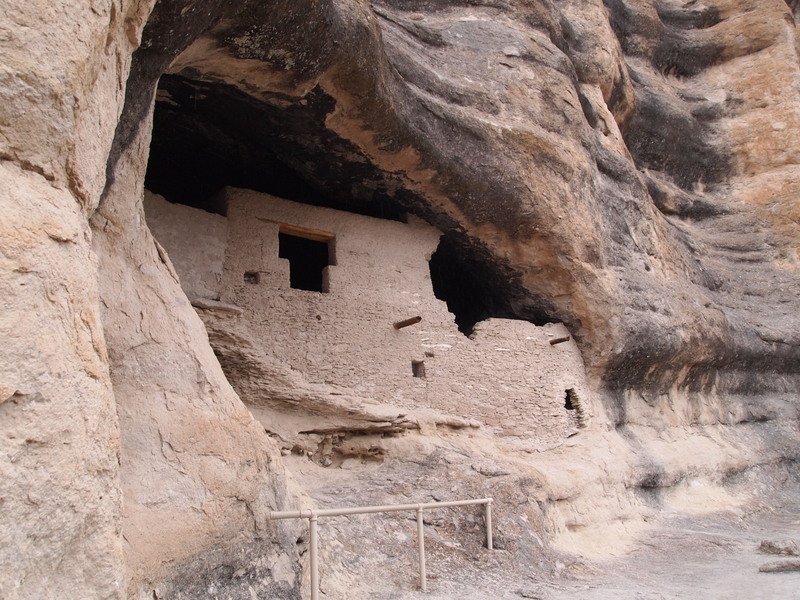 There were several glimpses of the dwellings along the way. 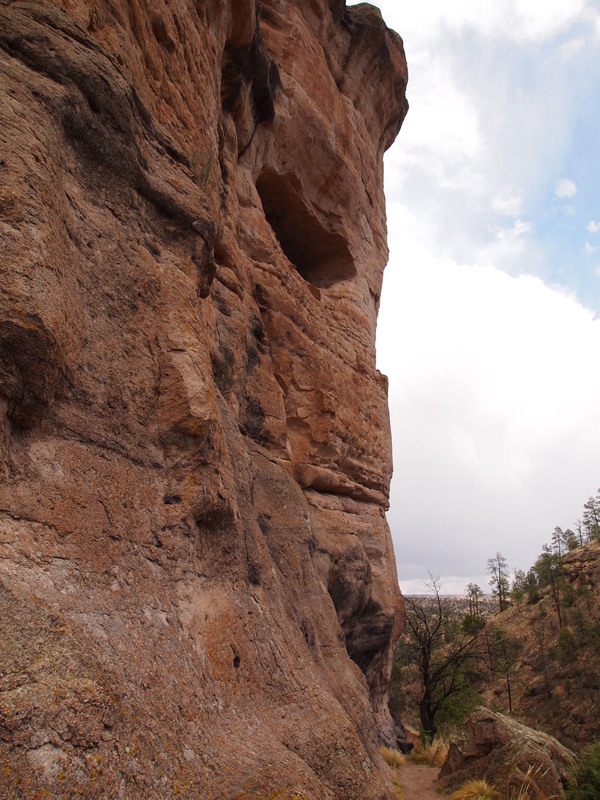 There are seven natural caves in the cliff; all except the seventh exhibit evidence of use by the Mogollon. 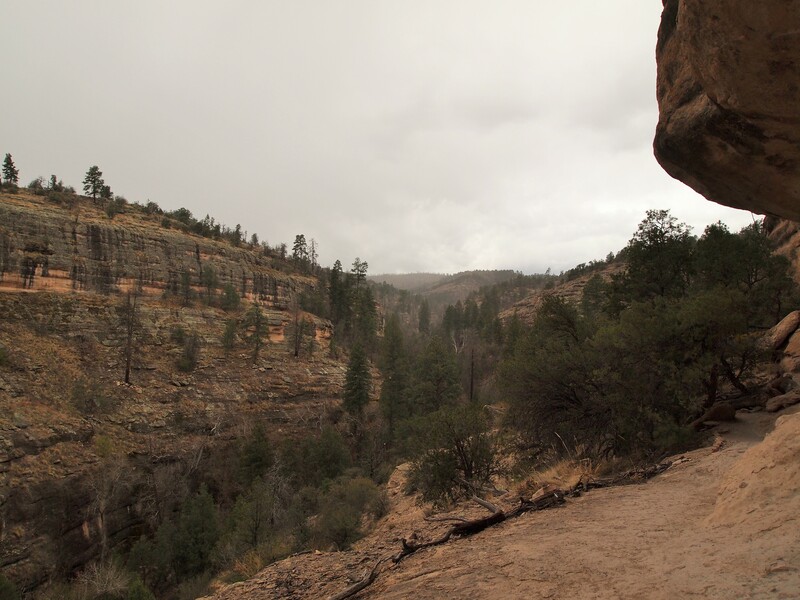 Just as we reached the first cave, we spotted rain in the distance. 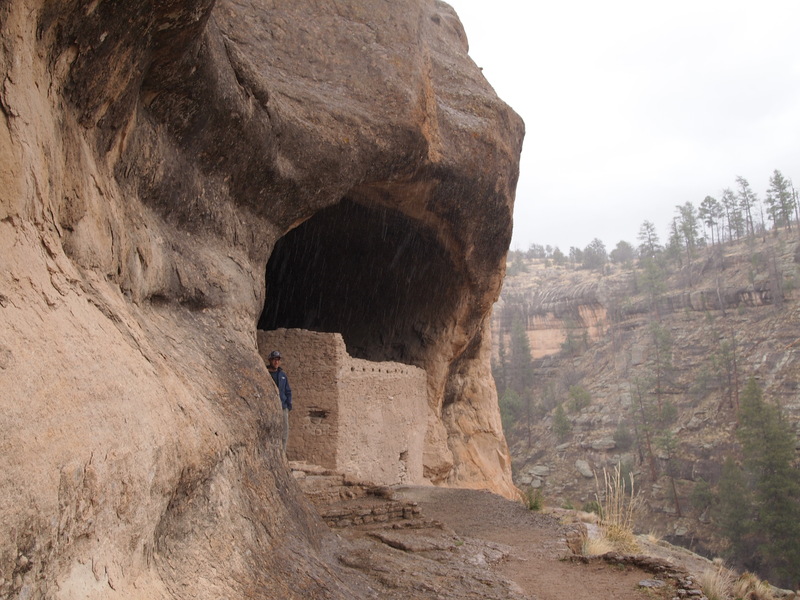 We had just long enough to gaze at caves one and two before the rain hit. 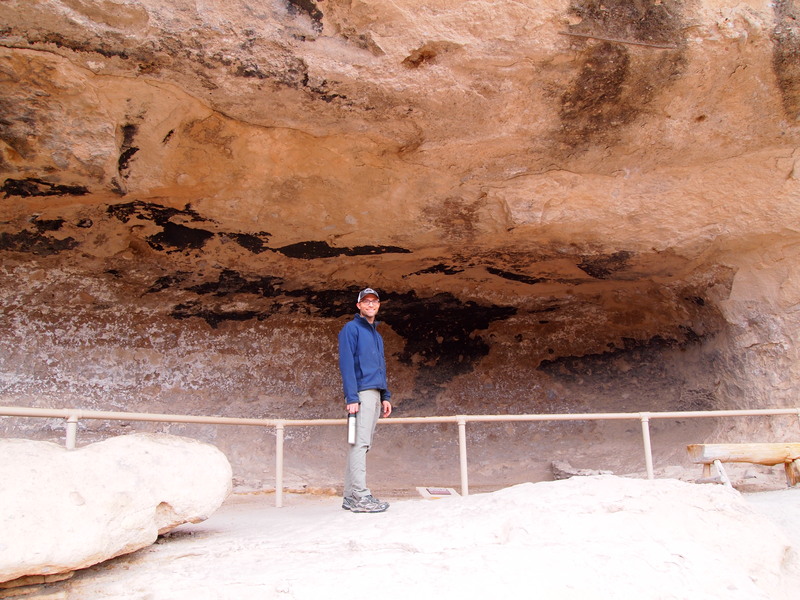 Luckily, we could climb into cave three for shelter. 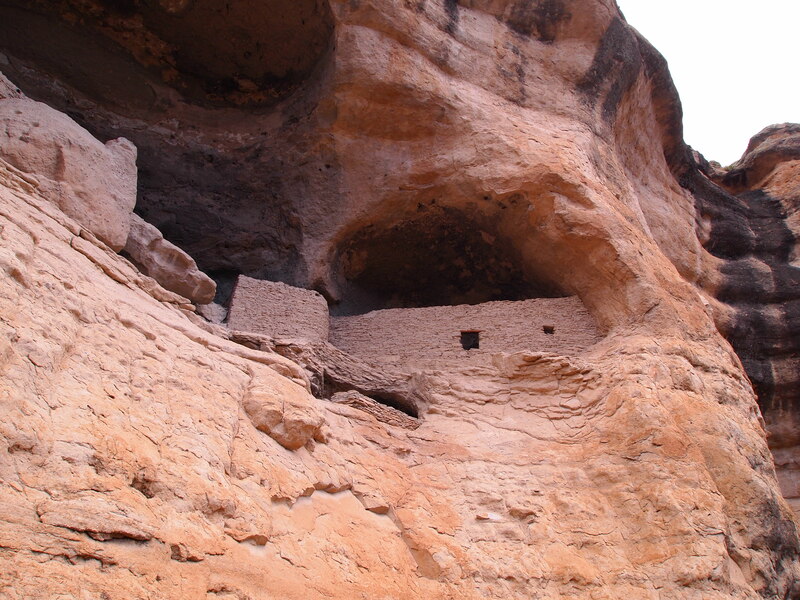 Unfortunately, by 1884, the cliff dwellings had already been vandalized. 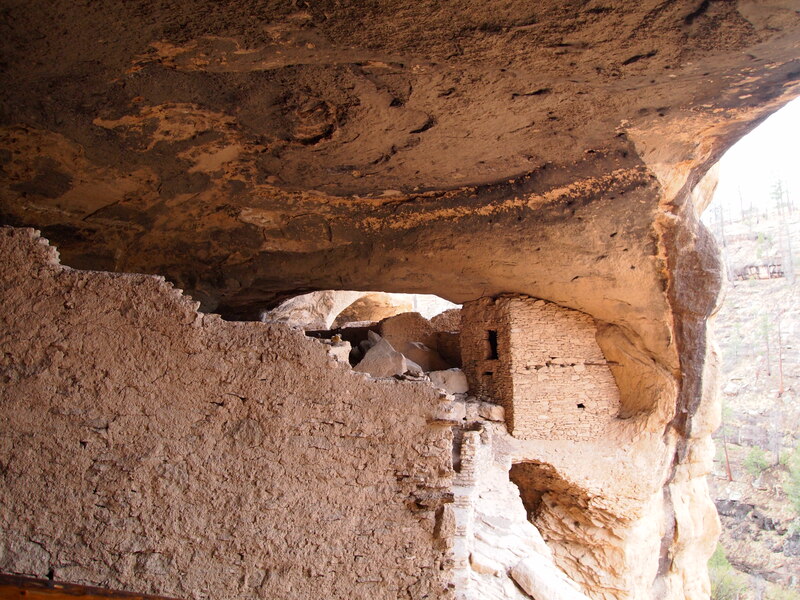 In the first archaeological report of the dwellings written by Adolph Bandelier, he wrote that walls had been torn down, roofs burned, and various possessions removed. 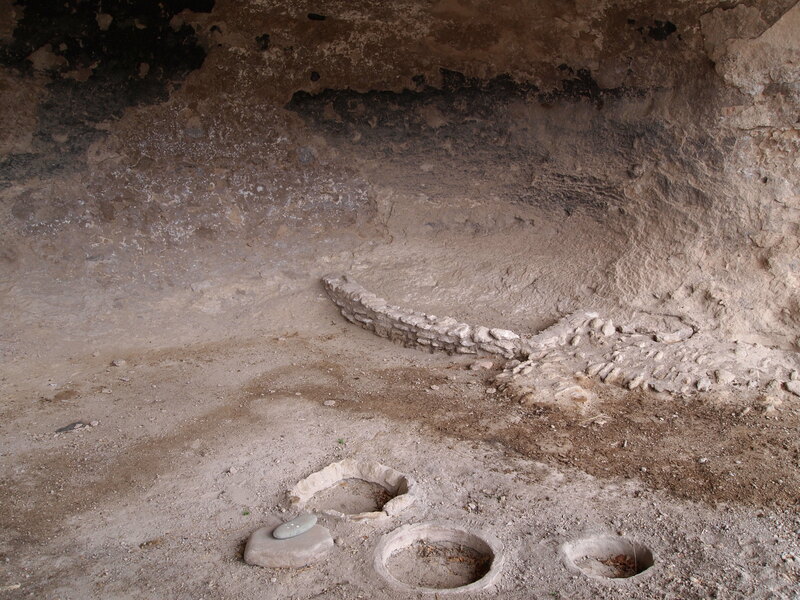 As a result, it has been difficult for archaeologists to deduce the purpose of each room. 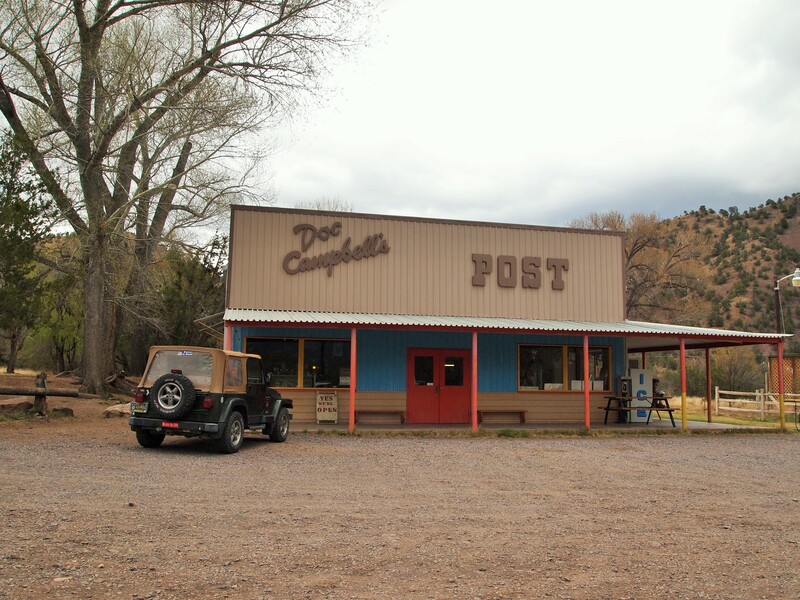 They believe that small areas were used for storage, medium areas for family homes, and larger spaces for community functions. Even still, almost 80% of the structures are still original. Archaeologists studied the growth rings in the timber in order to date the structures to the 1280s. Cave One is shallow but shows evidence of life. 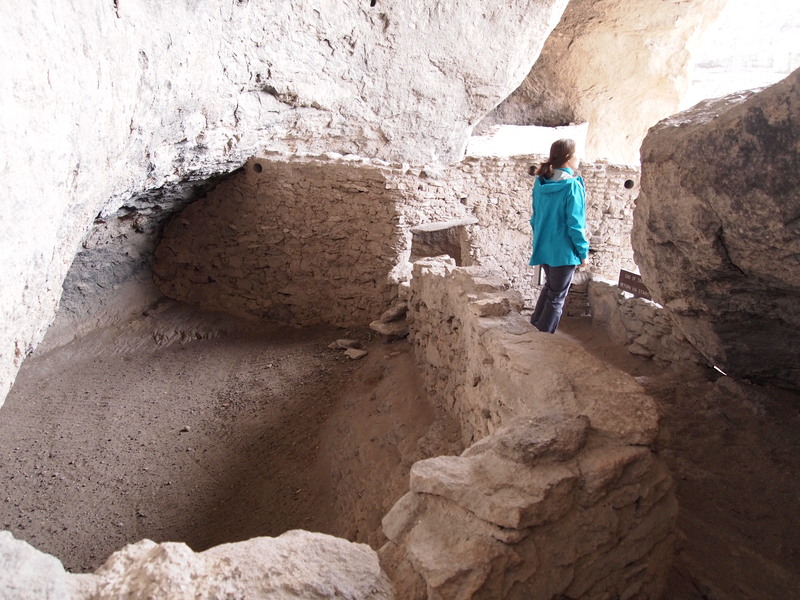 Archaeologists found foundations for three small storage areas and a larger central room most likely used by one family. 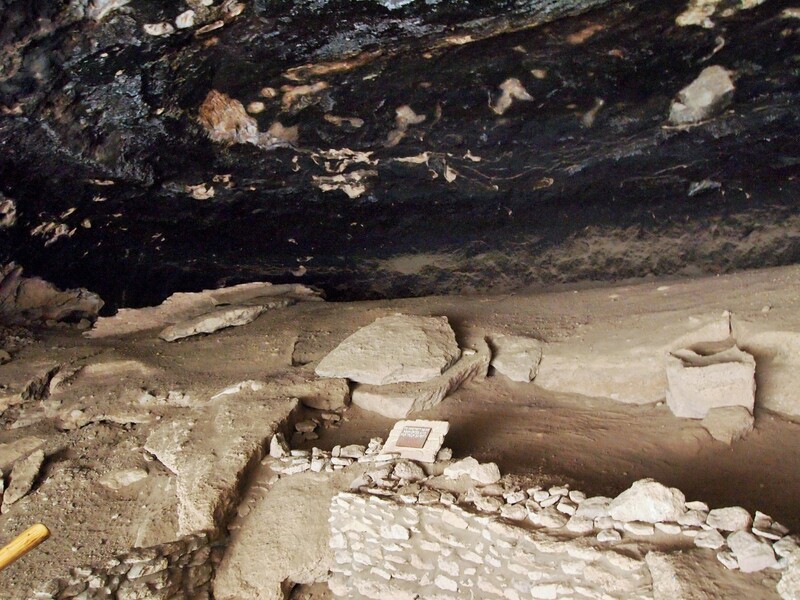 Though we couldn’t glimpse inside cave two, we were able to see how the front of the structures concealed the Mogollon within the cave. 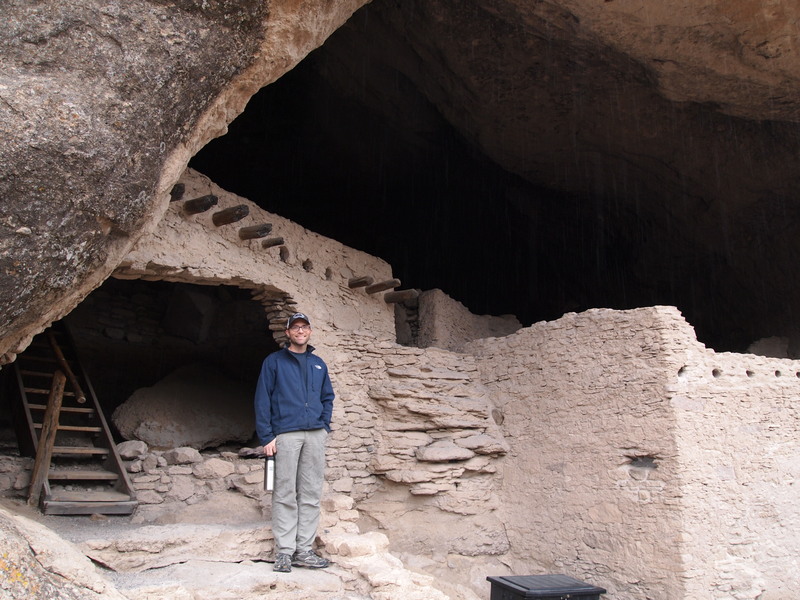 We were able to climb inside caves three, four, and five and explore the remains left behind by the Mogollon. Cave three was by far the largest. Its immensity was astounding. Standing inside the cave it was easy to understand its appeal. 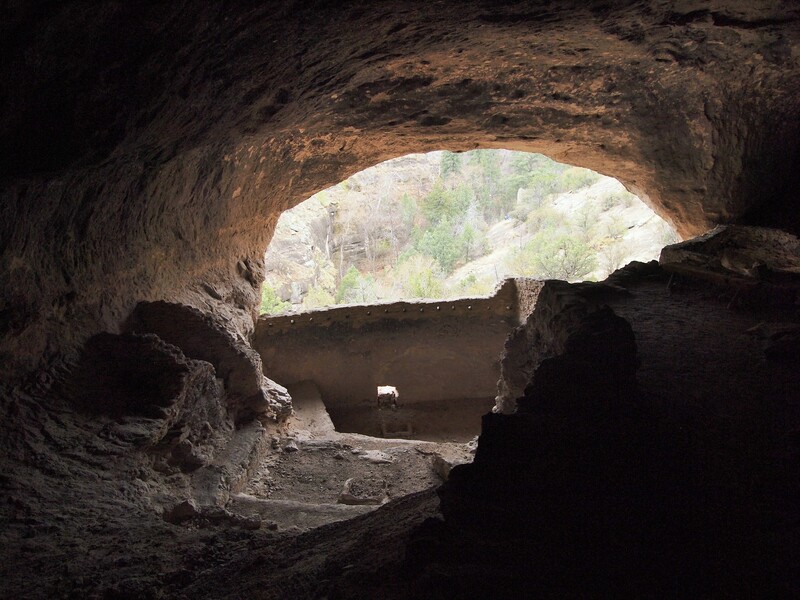 Since the opening of cave three is long and low, there is no chance the sun’s rays could penetrate inside the cave in the summer and fires would quickly warm the cave in the winter. 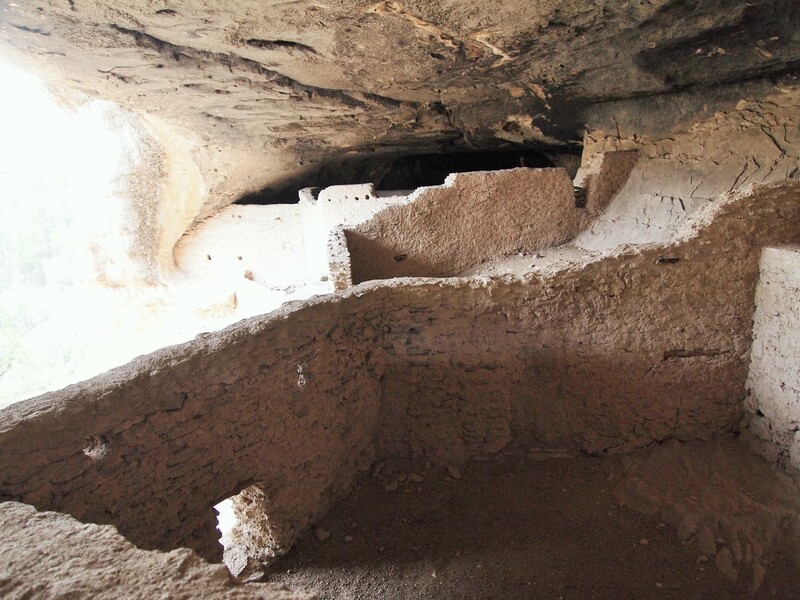 Archaeologists think the large space at the back of the cave was used as an indoor courtyard but they are unsure about the other uses of this cave. Caves three, four, and five were connected along the back so we were able to remain sheltered from the rain while we continued exploring. 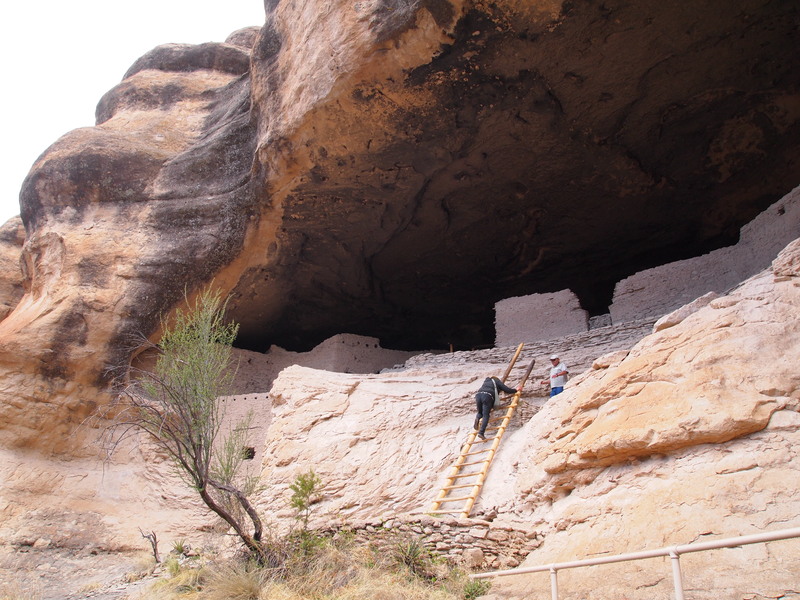 We were able to climb ladders to peer over walls and into rooms in an attempt to determine our own hypotheses as to how these caves were ordered. I thought cave four was the most spectacular. The presence of several more structures plus the connection to caves three and five made it feel like a real community space. Its open entrance was like a window to the forest, the source of life for the cave’s inhabitants. 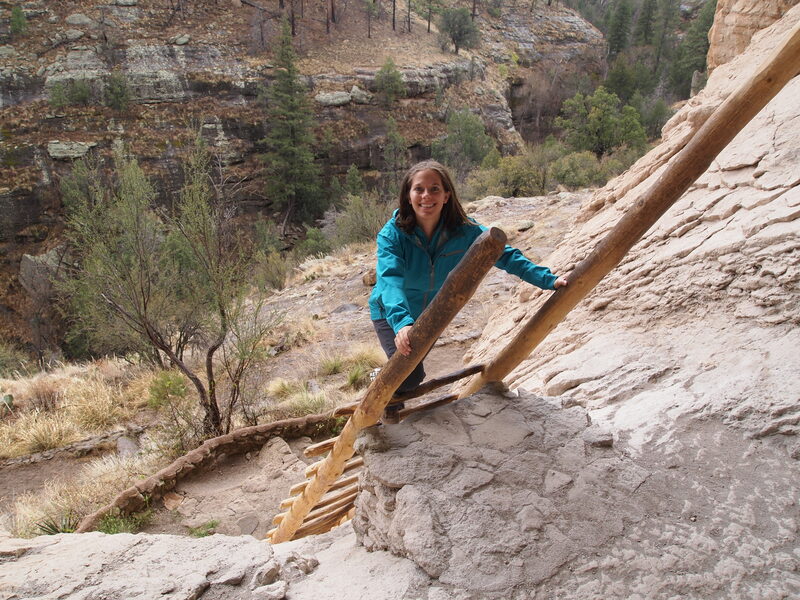 After the rain stopped, we climbed down the ladder from cave four and continued the hike to caves six and seven. 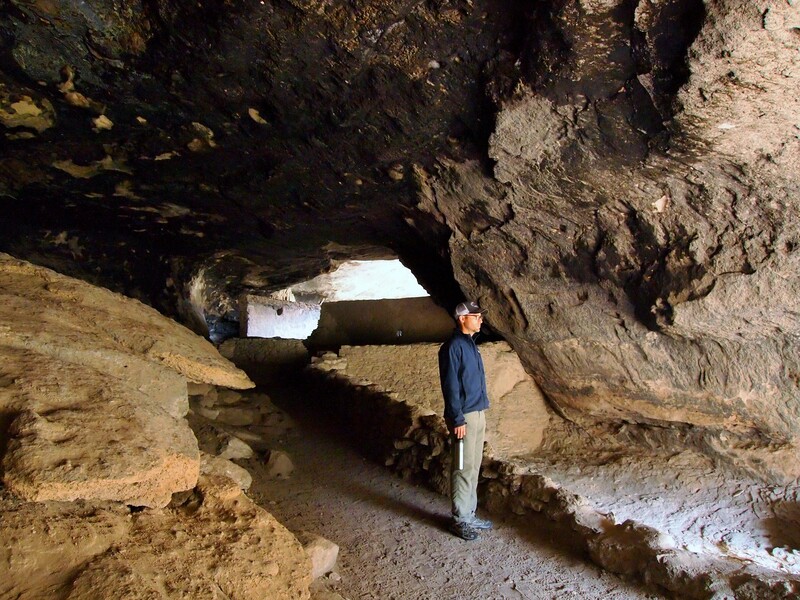 Cave six isn’t accessible, but shows evidence of use from the soot-blackened cave ceiling. 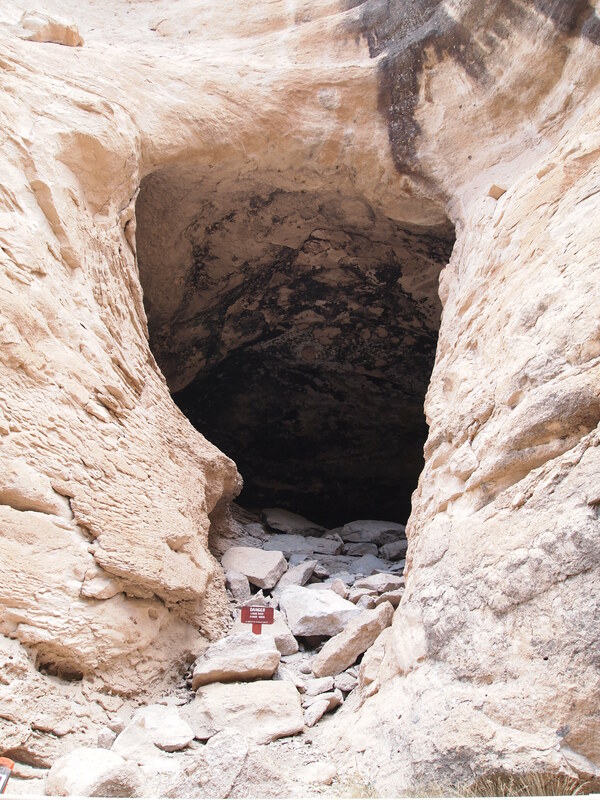 Cave seven, however, shows no signs of human life. 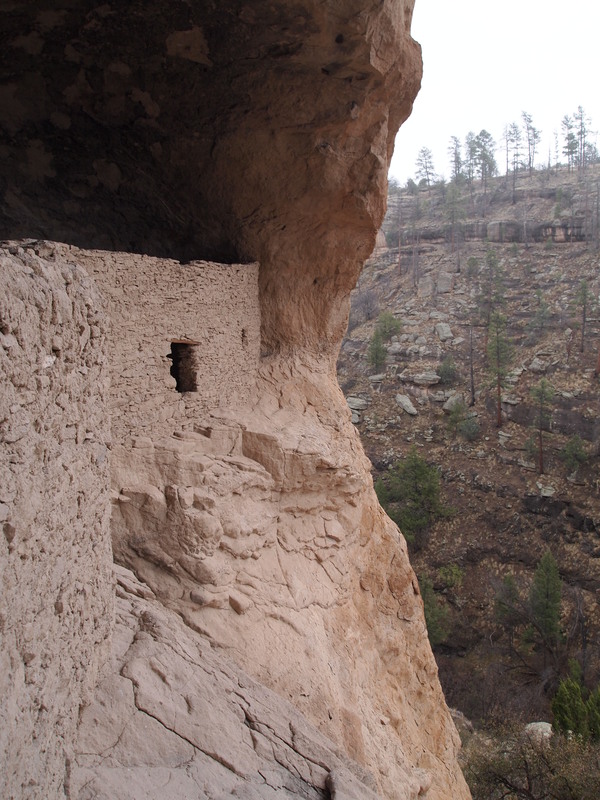 High in the cliff wall, with no evidence of Mogollon use, archaeologists are certain that cave seven wasn’t used. 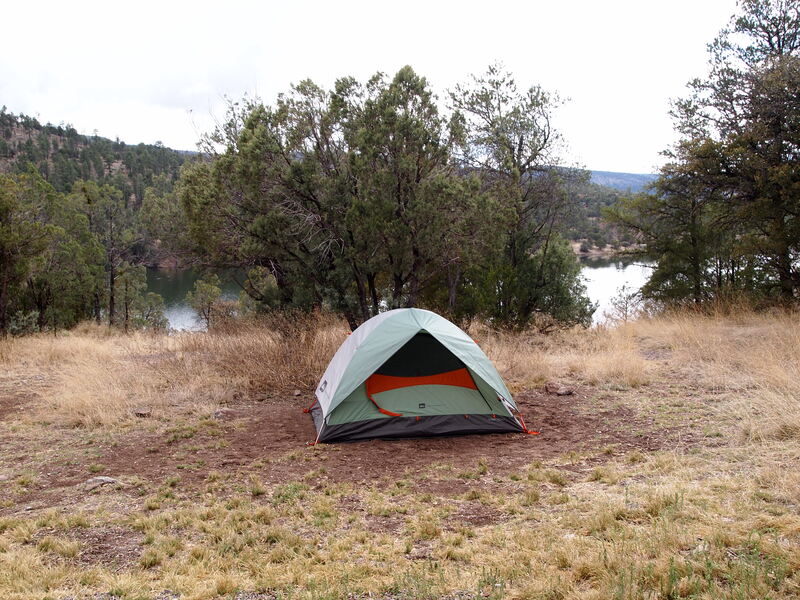 After we finished our tour of the cliff dwellings we drove to Lake Roberts in the Gila National Forest to find a campsite and set up for the night. 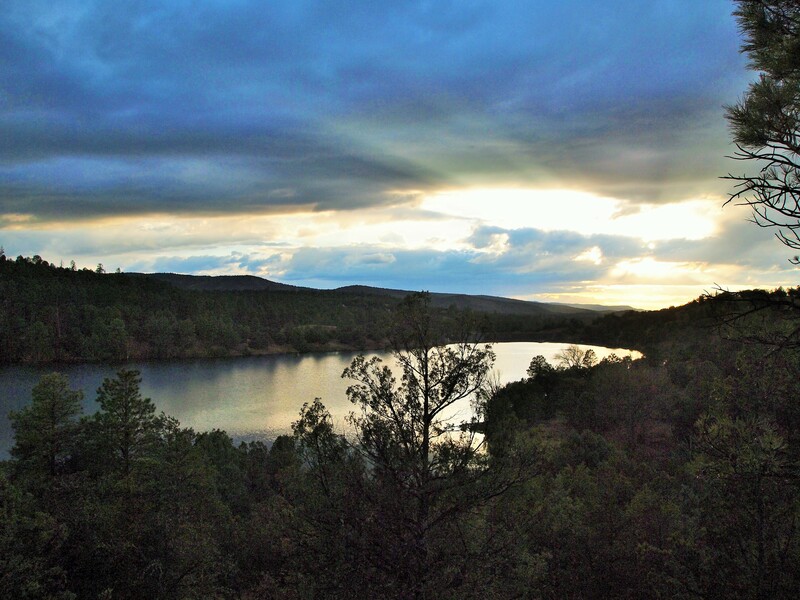 We found a great campsite overlooking the lake and had plenty of time to get situated and make dinner before the thunderstorm rolled in. Looks like a great place to live out of the elements.